There are some Western creations—take Total War, for example—which do an amazing job of recreating Japan. Then there are other Western creations—say, Kill Bill—which do a wonderful job of riffing on Japanese pop culture. Then there's stuff like SimCity Social. Come explore the rich world of Japanese culture in SimCity Social. Decorate and furnish your city with all new items like the peaceful Tea Garden, or fine-tune your business skills with the new Ramen Shop and Sushi Factory. 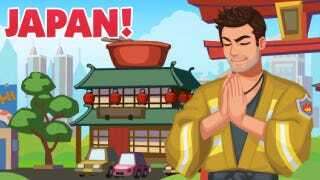 You can embark on new and exciting quests with Brad the fireman, who has just returned from an exchange trip with the Tokyo Fire Service. Brad has been learning the mystical firefighting techniques of Aiko, but they do not seem to be entirely effective. Help Brad fight fires and save innocent people in your city. After visiting your city, Japanese CEO Hiro Hatorri thinks that your Toy Factory might be the perfect place to make the latest craze – Mushy Monsters. Make him feel at home and earn his business by building the all new Imperial Palace attraction. You will be rewarded with good business and good fortune. Put your Zen skills to the test with the newest update to SimCity Social. This doesn't sound like the "rich world of Japanese culture" at all, but rather, a laundry list of cliches: "peaceful tea garden", "mystical techniques", and "zen skills". And its point of reference seems to be American sitcoms from the 1990s. Guess the bar is lower for Facebook games—shame because I love Sim City.